Are you going dotty with excitement over the arrival of your new bundle?! Share your excitement with this sweet polka dot themed baby thank you card. 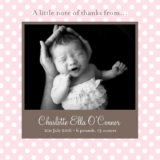 Personalise with your baby’s photo and text to make it your own.